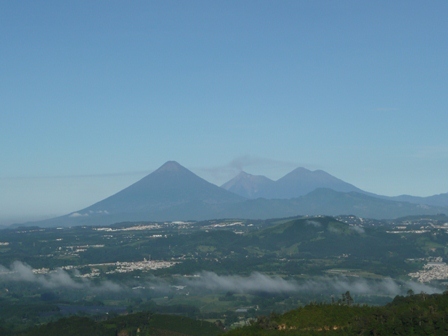 View of the Agua, Fuego and Acatenango volcanoes on the way to El Guatalón and Annexes. The road drags you to a landscape of unsuspected beauty. The dirt disguises every mile like daring your imagination to find what you think is an ideal terrain for growing such a noble bean. The narrower the path, the wider view posing with luxuriant nature and magnificent mountain hills until your eyes discover El Guatalón and Annexes, integrated by five parcels: La Loma, El Cuje, El Pajuil, Honduras and El Guatalón. The first one belongs to Jalapa department while the other four are located in Santa Rosa department, in the municipality of Santa Rosa de Lima. Adolfo and Guillermo Juárez at one of their parcels in Santa Rosa de Lima, Santa Rosa. Guillermo Juárez is the oldest of seven siblings. He and his second brother, Adolfo, are in charge of the farms. 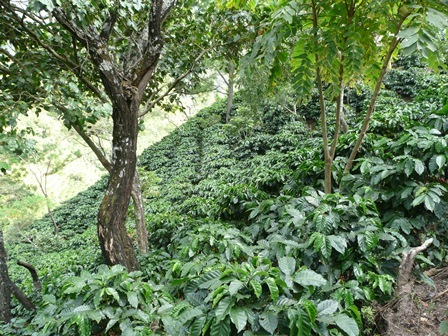 This could be the first time you hear from them, until this year they decided to explore the world of specialty coffees through the identification of distinctive cup profile micro-lots. A task they recognize is of titanic proportions since all four parcels are located in the slopes of the mountain. But it is a challenge they are willing to embrace. “When I was seven years old, my parents decided that I lived with my aunt near to Samororo located in Mataquescuintla, Jalapa where the public school was”, explained Guillermo who is now fifty-four. “The impact of being left by my mother was huge. I even got sick and almost died, I believe from sadness”, he recalled. During high school, it was even harder. “I fail all of my grades, so my father told me: ‘all we have here is cows. Your duty will be to milk them during the day, and you will go to school in the afternoon’”, a decision he marked as “wise” since it made him graduate and enter the University of Agronomy in Guatemala. Adolfo’s history is different. He nourished a natural intelligence with common sense, empirical knowledge and hands-on-administration concepts. “My father designated him as his right hand. He knew that he had to compensate his decision by inheriting him land. It is ironic that all of my siblings have a professional degree but when they are troubled, he lends them money”, stated Guillermo. Approved for processing in the wet mill. Guillermo and Adolfo complement each other. 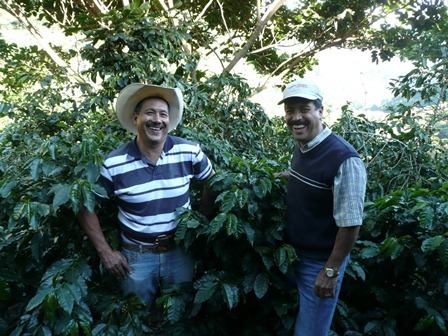 Guillermo does not have a house in the farm, but Adolfo leaves near the parcels. His house stands by the story of a man that has built every single brick with sweat and austerity. His home shelters the coziness created by Aura Monterroso, a sincere and kind woman who gave birth five children. “Where are the kids?” asked Guillermo. “They went to the hill”, she answered. A little face of a four years old shows behind the legs of the young mother. “They left her, since she gets tired easily”, she explained while serving lunch. “You can´t leave to the hill without food”, she kindly said, inviting everyone to sit at the table. Adolfo is in charge of supervising everything that needs to be done in the field. Guillermo asked about the results and the major problems they had. At some point they developed their own language of instructions and guidelines to follow. “We need to pick only the red cherry”, commented Adolfo to José María Pérez, “Chema”, the caporal, a man whose smile overflows his face. He wanted to hear his reaction. Chema avoids commenting. “Do you think that is possible?” Adolfo insisted. 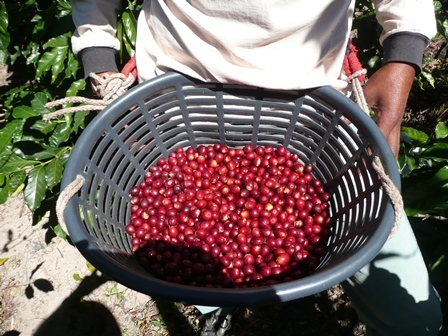 “Pickers need to fill up their pockets with money, so that is how they identify the color of the cherry”, Chema replied. Climbing the mountain is not easy, especially if you have to come back up two times in order to pick only the ripen cherries. Pickers come all the way from San Marcos, a department located South-West of Guatemala close to the border of Mexico. In November 7th, the department was hit by the second strongest earthquake Guatemala suffered since 1976. Around 50 persons died and thousands were hurt during the natural disaster. Guillermo and Adolfo would have to figure out the numbers to motivate pickers to follow their instructions with the only hope of improving quality and conquering demanding palates. They are determined to achieve higher prices for their efforts. In May 2012, they were close to qualify for the Cup of Excellence auction. Their coffee lot ended up in the 24th place, just one spot behind. They have always been selected during the national and first rounds of the international competition. They know there is still one step further, just an extra one. “We do have a wet mill which capacity is 3,500 bags of parchment coffee. But we normally sell in cherry to the middleman. We want to go further now. We know we can deliver higher quality”, Guillermo indicated. After all, they both know living and succeeding is just about that: always make an extra effort. It will be now up to you, the buyer, to say if the effort was worthwhile making. Logistica eficiente, la nueva tendencia #negocios y #café.